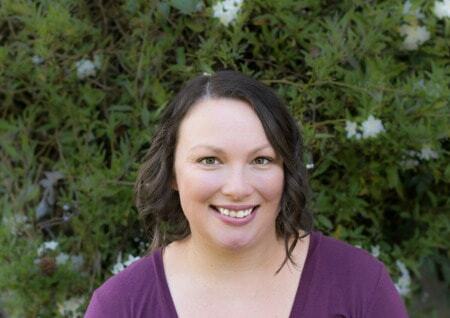 January 28, 2019 By Aileen Leave a Comment This post contains affiliate links. As an Amazon Associate and member of other affiliate programs, I earn from qualifying purchases. 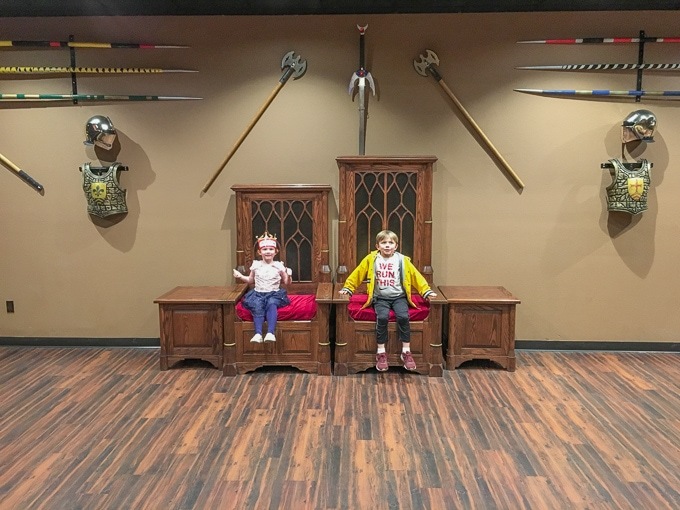 Thinking about buying tickets for Medieval Times Dinner & Tournament? 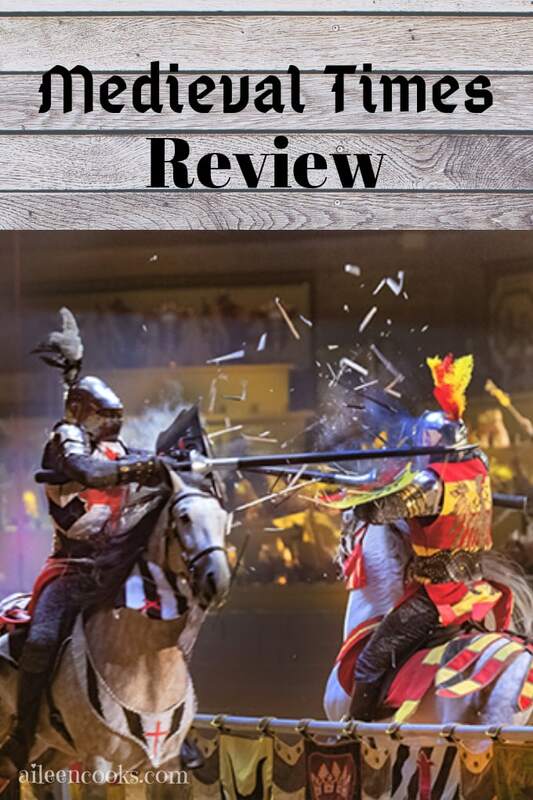 Read this Medieval Times review first! This post is sponsored by Medieval Times. We received complimentary admission in exchange for our honest review. 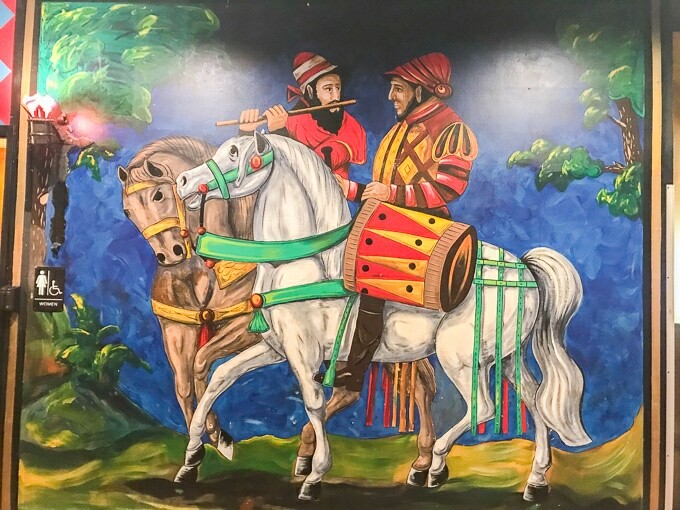 We took a trip to Southern California last week to visit Disneyland and got to make a stop at Medieval Times in Buena Park on the day we arrived in Anaheim. We caught the 7 PM show with our three kids (ages 6, 4, and 2). The original plan was to get there early to experience their extra offerings for a full Medieval Times Review. Unfortunately, a missed flight made that impossible, so we arrived right before the show started. Even so, we were helped right away. Our tickets were already reserved, so they had seats waiting for us. My first thought about Medieval Times was how elaborate it is. It looks like a real castle. Everyone is dressed in period pieces and speaks as if they are from those times. When we entered, everyone was given a crown to wear (similar to the ones you used to be able to get at Burger King). The kids were excited right away! So were we. The seating inside the castle is stadium style, so there is not a bad seat in the house. We were towards the back and could see everything. Even my littlest could see the whole show without anyone’s head in her way. We had a dedicated server who was assigned to us and a couple of other groups. She was very friendly and got drinks in front of us quickly. Soda and a meal is included with your ticket price, alcoholic drinks are extra. My husband ordered an alcoholic drink and they brought a card reader to our table so he didn’t have to get up. They also have a bar outside of the stadium for pre-show drinks. The server immediately explained that we our area of seating was assigned to a certain knight and we were to cheer for him and never boo. 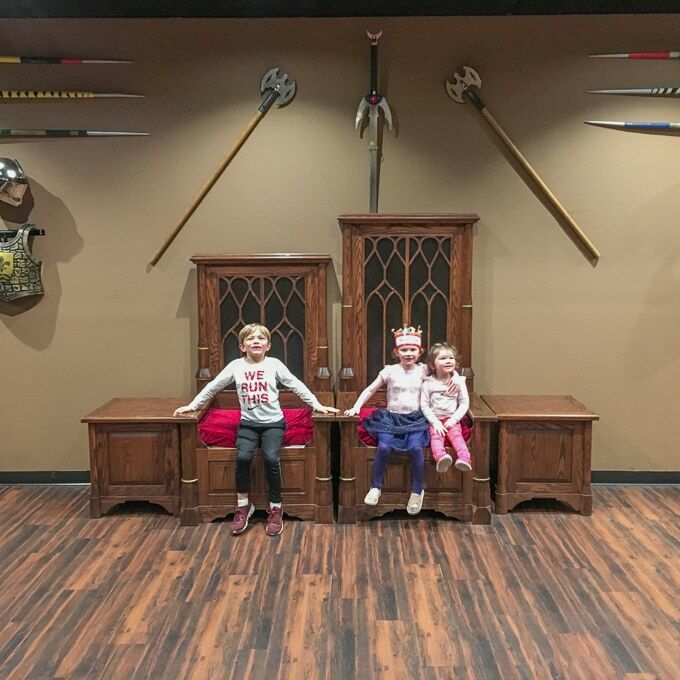 Our crowns matched our knight (the red knight). I have to say that being assigned a knight to cheer for made it so much more fun. They even had the color of your knight glowing down over your seats, which is why some of our photos are red in this Medieval Times review. The people in the stadium around us got really into it and were booing and cheering the whole time. So were our kids. Especially our two year old. She was cheering and screaming for most of the show. So, the show started at 7, but we probably didn’t start getting fed until 7:30. If you are a family of early eaters (like us), I would recommend eating a little something before you get there. Speaking of food, there are no utensils. You have to eat everything with your hands. I knew this before we got there, but was surprised when they put soup in front of us. The soup bowl had a handle, so it was easy enough for the grown-ups to grab and drink. It was a little more challenging for our daughters. Luckily, the server slyly pointed out that we could use the coffee stirs as straws. The kids thought this was hilarious and happily sipped their tomato soup through straws. The food was good. We were served soup, cornbread, chicken (they said it was baby dragon, ha! ), potatoes, and a sweet bread for dessert. They also offered up coffee with dessert. One thing to keep in mind is that your tickets do not include gratuity. I do recommend bring some cash for tip as your server is available to you throughout the entire show. Ours was very helpful and friendly. 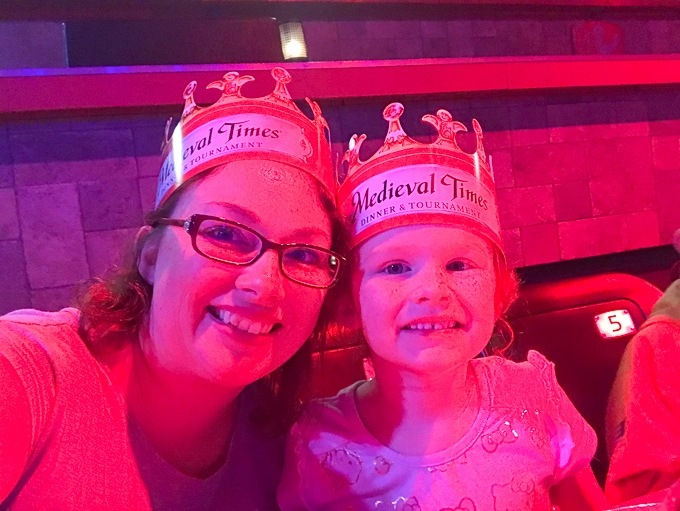 Is Medieval Times good for kids? The show was very loud, which was good for us. We did not have to worry the entire time about our kids making too much noise. They were permitted to yell and scream (so long as they weren’t booing the Red Knight) as much as they wanted. It took the stress off of us and allowed us to just enjoy the show. Although the knights are jousting for part of the show, it is not overly violent. During there jousts, there are times when they get off of their horses and “fight” but it is obviously pretend. My 6 year old tends to get a little afraid in moments like this and he told me he knew it was not real. It did go a little late for our littlest and we ended up leaving about 10 minutes early because she was tired and crying. We still didn’t feel like we missed much of anything and the two older kids were happy and excited as we left. The Medieval Times tournament was a big hit. As we left Southern California at the end of the week, our son said his favorite thing was the “Knight Show” at Medieval Times. That tells me it was worth it. He loved it. It was a great way to spend an evening together as a family. I highly recommend going at least once to see what it’s all about for yourself. You can also purchase tickets now for just $37 at any of the castles. Use the coupon code USF37. The coupon code is valid through 1/31/2019. 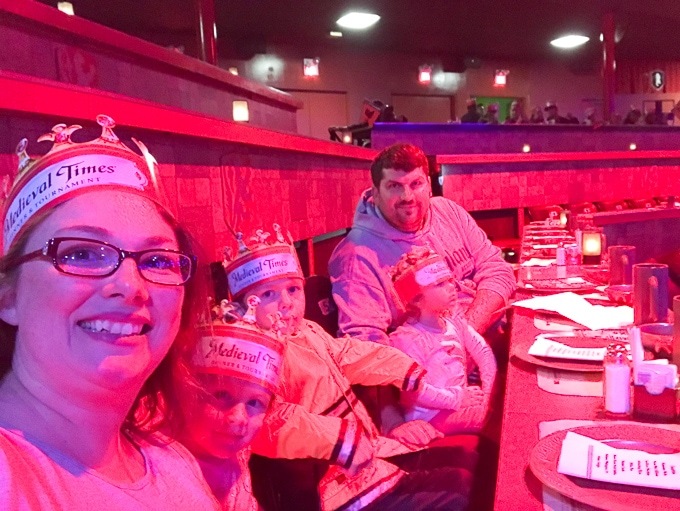 We hope this Medieval Times review helped you decide on whether the dinner & tournament is the right fit for your family. Make sure you follow us on social media and subscribe to our newsletter for more reviews like this one!